Misty is now a mature 20 years old. 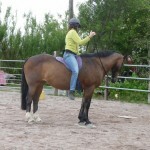 She has been in our family since she was a 2 year-old and has taught several people to ride (including me and my three, now grown-up, children, as well as Marte’s daughter and son). She’s spent the last few years mostly in Marte’s, having a pretty easy life! 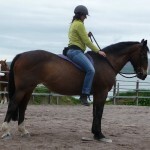 Misty does know about mats and standing (being a cob/irish draft) is one of the things she does best! So mats can be used to build patience but also to build enthusiasm and movement. Michaela worked with Misty and multiple mats. These mats were scattered pretty randomly around the top half of the arena. 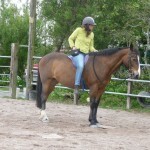 Misty was perfectly happy to go and stand on any mat! Alex wanted her to move off with a proper bend and flexibility in her body so to get this MIchaela hugged her! This was a hug with a feel of movement in a direction away from Michaela. When Misty adjusted her balance..Click and Treat (CT). Michaela then moved into the space that was opened up by Misty’s change of balance as she reached to give her a treat. The hugs were repeated until Misty was bent in the direction of the next mat, when Michaela picked up the lead and moved off with her. The amount of bend needed depended on the location of the next mat and can be made more or less by the choice of mat to move to. Initially they chose mats that were easy to reach with a little bend but as Misty softened and became more flexible, Michaela (and the audience) could pick mats that required more bend to reach. As well as moving away from hugs, Michaela also asked Misty to move towards her with a hug. As Misty shifted her balance, Michaela moved back to allow Misty to bend more towards her. In this case feeding is back further as Michael encourages Misty to keep the bend.. 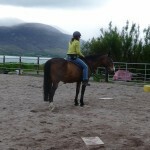 In all of the pictures where Misty is on the mat, the lead rope has been thrown casually over her back. This then becomes a cue to stand and wait. In the next sequence of pictures, Michaela sets up the turn towards her with a couple of hugs and then lifts the rope off Misty’s back as they are ready to move onto the next mat. To make the mat an even better place to be, we can add in other requests and put them on a high rate of reinforcement. 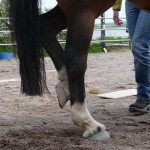 During this clinic we used leg flexions in order to achieve this…. starting with the front feet. Here Misty is barely lifting a front foot but as the session progressed she lifted it higher. As ever, successive approximations were used so for the initial try, CT, but with each ask, a little more is required. As she lifted higher Michaela could then support her foot by just holding the tip of her toe and hold her other hand up as a target for Misty’s knee. Over the course of the clinic this improved hugely. 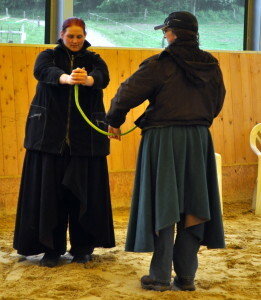 Initially there was a lot of wiggling of her leg, but Misty learned to find the target and hold her knee there. 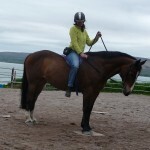 Gradually Michaela changed her cue so that she could ask for the lift from touching the shoulder…This is needed to be able to transfer to asking under saddle. 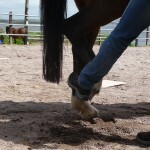 The gallery below shows hind foot lifts….Click on a picture to enlarge it. Striding out! You can see that MIchaela has completely released the reins to allow Misty to go to the mat freely. A huge benefit of this clinic for Misty was that she learned to move very smartly from one mat to the next with huge enthusiasm. 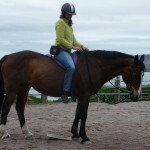 As she has been ridden primarily for the past three years by Marte’s now 5 year-old daughter, she has really only been pottering!! 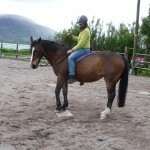 Her nature is that shes a quiet slow-moving cob….ideal for giving confidence to young children. In her earlier years she was an excellent show-jumper and so it was great to see her move quickly again and clearly loving it..
Another advantage is that at 20 years of age she now has a level of arthritis, so the leg lifts and flexions are a great way for Misty to build strength and keep her active. As ever, when watching the clinic, I’m not very focused on taking photos so they’re not always the best or even very good moments that are shown here. And finally…..I just love this picture of Michaela and Misty…even from this angle you can see that they are both focused on each other. Michaela and Misty focus on each other! Another question posed at the Q&A session was ….Does Clicker Training bring out qualities in animals that you don’t otherwise see? Kathy Sdao commented that CT allows animals to show behaviours that reveal their true personalities, while Ken Ramirez said that he sees comfortable and happy animals. Horses chortle and chuckle, expressions that no other training has ever produced according to Alexandra Kurland. Karen Pryor described how CT teaches animals to think, pick up concepts, combine cues and teaches them to be more observant. It makes for excellent relationships and trust. She talked about the creative porpoise experiment (which you can read about this in detail in her book “Reaching the Animal Mind” or have a look at her video here) which gave her the biggest surprise of her life. A porpoise was Clicked and treated only for a novel behaviour each time. The porpoise went through it’s repetoire and then showed behaviours never before seen. It appeared that the porpoise thought up new behaviours in the tank at night! Finally Michele Pouliot described how guide dogs who have been taught to find things for their blind handler, lead their person to the correct spot. If the handler reaches out and keeps missing the item the dog pushes the person into the correct place for the hand movement that they are using….not a taught behaviour. This has been shown to happen with many dogs. So it seems that CT causes both human and animal to learn more, develop their relationship with fun and to allow expression of personality and creativity. What has been your experience with your animals? Having just read a great article by Inge Teblick How a carrot can become a stick I wanted to make a few comments. When teaching clicker training to new learners, there are two common mistakes they make, firstly, they don’t click often enough at the beginning of training a new behaviour and secondly, they keep clicking that first step far too long! Why is important to click lots at the start? 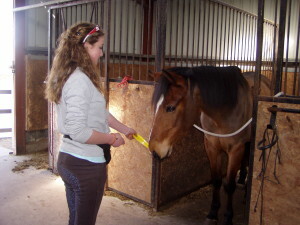 The function of the click is to mark the performance of the correct desired behaviour and it also acts as a bridge to the moment when we deliver a reward (be that food….most commonly, or a good scratch, or whatever your horse is prepared to work for). 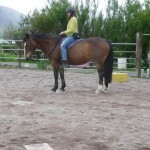 Horses need to learn that what they are doing is the correct behaviour by repetition. 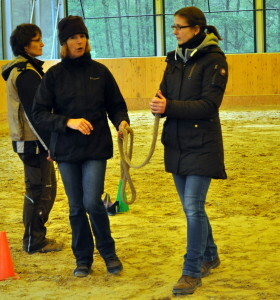 How much repetition is needed depends so much on the horse, his/her experience etc. 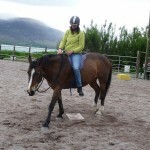 It is important to recognise that just a few repetitions may not be enough for a behaviour to be truly learned (how many times in learning how to ride have you been told to keep your heels down? 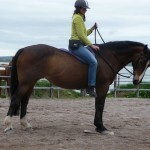 ), but it’s also very important to keep the horse interested and enthusiastic and not bore them by too many repetitions. Alexandra Kurland talks about training in loops….CUE…leads to …BEHAVIOUR…..leads to CLICK/REINFORCE….leads to….CUE….leads to …BEHAVIOUR….. and so on. 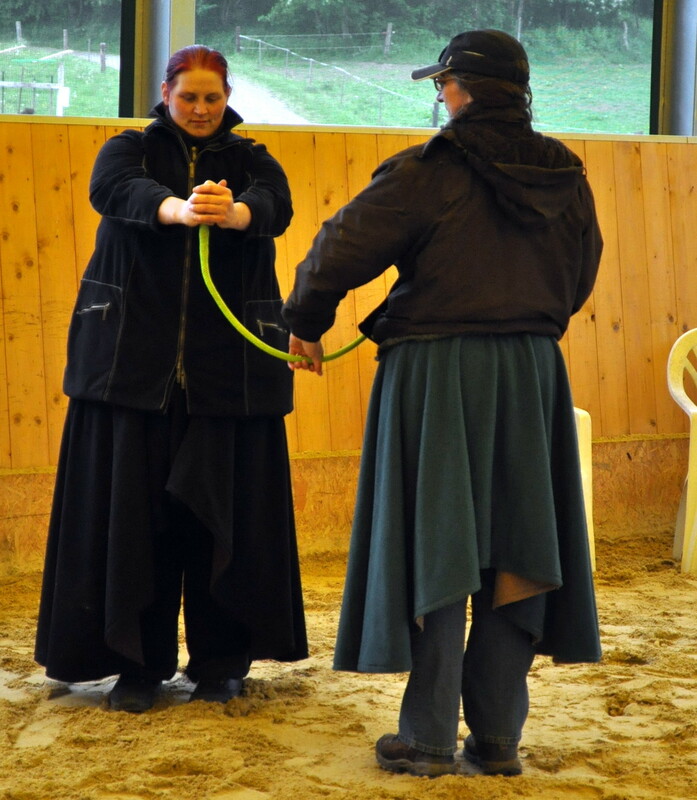 She says that when a loop is clean, (meaning the horse is performing the behaviour readily), that you get to move on (increase the difficulty) and not only can you move on, but you should move on. The example I give my trainees is that when we learned to write, we started by tracing very simple shapes, following the dots. When we got a gold star from the teacher we went home thrilled and delighted. However some years later, we are writing long essays for the reward of a tick on the end of the page and maybe a ‘very good’ comment from the teacher….we would not appreciate gold stars every two letters at this stage!